IWCE Las Vegas, 05 March 2019: The Mission Critical Open Platform (MCOP) project, working to streamline the process of developing, testing and bringing to market standards-compliant Mission Critical Push-to-Talk (MCPTT) applications, has announced successful integration with the Sonim XP8 ultra-rugged smartphone. A Band 14/FirstNet-enabled device built to work in extreme conditions and environments, the XP8 now supports MCOP APIs and will be demonstrated this week on Booth 3270 during the IWCE 2019 exhibition on 6 and 7 March. Sonim joins MCOP project partner Bittium in enabling easy integration of multi-vendor MCPTT apps into Mission Critical devices by supporting open MCOP APIs. 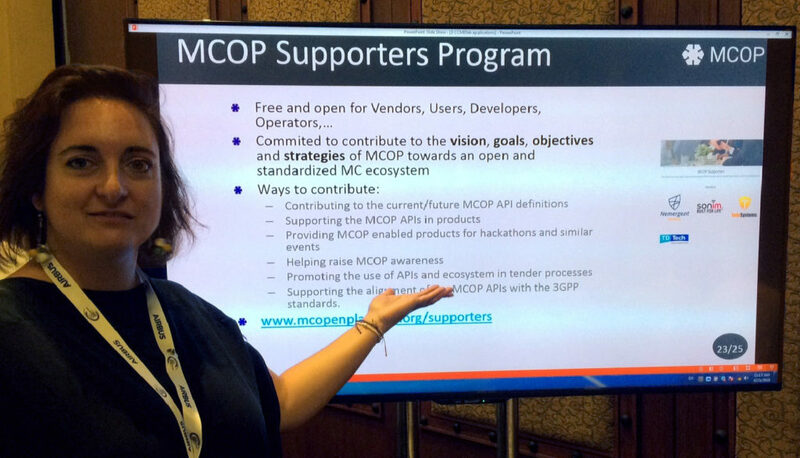 Sonim is a member of the MCOP Supporter Program, in which organizations commit to the principle of using standards and open interfaces. MCOP ensures smooth deployment of mission critical applications over different MCPTT SDKs, devices and chipsets: all MCOP components are fully compliant with 3GPP standards. In addition, developers, researchers and other practitioners can test, evaluate and validate their MCPTT applications through MCOP testing facilities. Bittium’s MCOP-compliant Android-based Tough Mobile smartphone is designed and built for demanding mobile security and public safety markets. Bittium Tough Mobile supports professional users such as government agencies, authorities, first responders who need to communicate securely and reliably in critical communication situations. Bittium was the first device manufacturer to demonstrate MCOP compliance at Critical Communications World 2018 in Berlin. The Mission Critical Open Platform (MCOP) is a collaborative project with the financial assistance award 70NANB17H151 from U.S. Department of Commerce, National Institute of Standards and Technology through the Public Safety Innovation Acceleration Program (PSIAP). The University of the Basque Country (UPV/EHU) leads the MCOP project. Project partners are Bittium, Expway and TCCA. The MCOP project was part of the conferences that took place during the Critical Communication World in Berlin last week. MCOP showcasing simplicity of development for MCPTT applications at Critical Communications World 2018 in Berlin. Emil Olbrich’s article in March issue of Mission Critical Communications highlights the importance of MCPTT interoperability and how MCOP will help towards truly open ecosystems. TCCA will hold a webinar together with ETSI about the next MCPTT Plugtest on 16 Nov 2017, where MCOP will also be presented. The webinar will be hosted by Radio Resource International Magazine. TCCA’s Leading edge PPDR (Public Protection and Disaster Relief) applications workshop took place Thursday 12 October in Copenhagen, Denmark. The MCOP project was presented at the event by TCCA’s Harald Ludwig.